Also known as trustee in bankruptcy. Some jurisdictions appoint bankruptcy trustees while others provide for their independent certification by a self-regulatory agency. In Canada bankruptcy trustees are licensed by the federal Superintendent of Bankruptcy. One of the requirements for a candidate for the bankruptcy trustee license is a three-year course called the National Insolvency Qualification Program (NIQP). "The trustee is the legal representative of the debtor...."
"... the trustee is a representative of both the debtor and the creditors. "In order to liquidate the bankrupt’s property ..., the trustee must take control of it. At this stage, the trustee is the bankrupt’s successor or, in a broad sense, his or her representative. However, the trustee’s juridical personality is not to be confused with that of the debtor. In fact ... the law recognizes that the trustee has the right to sue the debtor if necessary. "This power illustrates the importance of the other aspect of the trustee’s functions, that of representing the creditors in the management and liquidation of the bankrupt’s property. The trustee’s legal position is therefore more akin to that of a third person in relation to the debtor. On the one hand, the trustee is subrogated to the bankrupt’s rights in the exercise of his or her powers to hold and dispose of property of which he or she has been granted seisin. On the other hand, the law treats the trustee as the creditors’ legal mandatary who will liquidate the property entrusted to him or her for the creditors’ benefit. The dual nature of the trustee’s duties does not therefore make it possible to regard the trustee as a third person in relation to the bankrupt, given all the powers conferred upon the trustee by law in order to preserve and liquidate the debtor’s property." "The trustee is, first and foremost, an officer of the court .... and the Court regards him as its officer, and he is to hold money in his hands upon trust for its equitable distribution among the creditors. "... the trustee has the same status as the interim receiver. 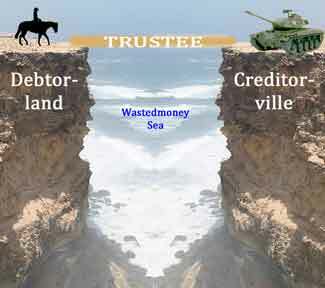 This status obliges the trustee to act equitably and prudently, to cooperate with the court and, in a more general manner, to contribute to the proper administration of justice...."
The bankruptcy trustee's duties are to meet with the debtor, prepare the official documentation such as the debtor's financial statement, notify and check the claims of creditors, collect and sell the debtor's assets, except those exempt from seizure by provincial and federal laws, and hold the proceeds in trust for distribution to creditors. "The trustee shall, as soon as possible, take possession of the deeds, books, records and documents and all property of the bankrupt and make an inventory...."
"The trustee shall verify the bankrupt’s statement of affairs." The role continues through the bankruptcy. The bankruptcy trustee administers the bankrupt's estate including, where the bankrupt is an individual (and not a corporation), shepherding the ultimate application for the bankrupt's discharge. "When the trustee is appointed he assumes responsibility in two areas: he becomes the debtor’s representative (and) he becomes the representative of all the general creditors to the extent that he can even act on their behalf against the debtor." "... a trustee steps into the shoes, so to speak, of the bankrupt and as a general rule acquires no higher right in the property of the bankrupt than that which the bankrupt enjoyed.... (A) trustee in bankruptcy is a representative of creditors...."
"... the federal bankruptcy trustee ... in carrying out his function of assembling the bankrupt's assets and selling them, ... was given a double capacity. In one capacity he acquired whatever property rights the bankrupt had before the institution of the proceedings. In his other capacity he acquired, or inherited, whatever rights the bankrupt's creditors had. Thus a claimed interest in the bankrupt's property was not necessarily good against the trustee simply because, under applicable state law, the claimant could have recovered the property from the bankrupt. To be good against the trustee the claim had to be effective not only against the bankrupt but against his other creditors. In his role as champion of the unsecured creditors, it was not only the trustee's right but his duty to seek to invalidate as many property claims as he could, since each defeated claim brought more assets into the estate and increased the fund for distribution."